I don’t know what’s happening but I think we might be in a golden age of religious/spiritually conscious hip-hop. Between the outright evangelicalism of Lecrae to the heady social reflection of Kendrick Lamar, there is an evident emphasis on spiritual matters in many of the prominent names in rap music. Hell, even Kanye West ostensibly released a ‘gospel record’ this year (I mean, I guess he did in the way only Kanye can, which is to say, insanely). 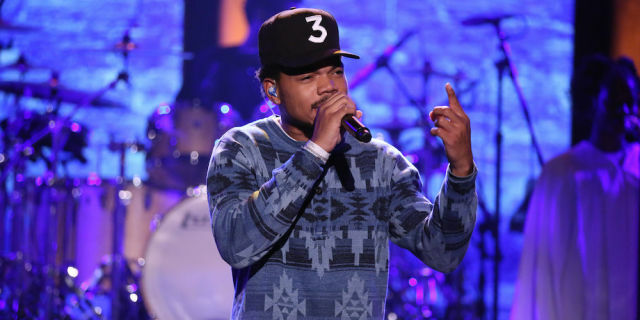 But, whereas Lecrae wants to preach and Kendrick wants to teach, sometimes all you really need is to praise – and Chance the Rapper is here to lead the choir. For his third proper release, yet another independent mix-tape, Chance the Rapper has sobered up a bit more and found that the day is beautiful, his cup is full, and by God, it’s good to be alive. Coloring Book is a short burst of joy that doesn’t really have much to say but to meditate on all the ways Chance finds himself grateful. It’s short and sweet with very little filler but, really, that’s all it needs to be when one is shouting for joy. Following up his deservedly acclaimed sophomore album, Acid Rap, Chance the Rapper isn’t really looking to rewrite his formula. Filled to the brim with the smooth vibes of his backing band The Social Experiment and his uniquely hyper Chicago-bounce, the album sounds exactly like what we’ve come to expect from Chance. Sure, there’s a dip into trap music (“Mixtape”) and even a bit of choral pop (“Same Drugs”), but mostly he plays it safe. Not that this is a bad thing – I really don’t know many rappers that can imbue such a sense of fun into their music. This album is a joy to listen to – even if it does feel a bit familiar. A bit more unfamiliar, however? The gospel samples – SO MUCH PRAISE! Chance the Rapper performing “Blessings” on The Tonight Show. Nearly every song here is joyous. From the Kanye assisted opener “All We Got” that bursts out of the gate with gratitude for music to the outright and, quite frankly, blunt praise of “Blessings,” you can tell that Chance is in a happy place. But he is not shying away from the source of his happiness – God. He might have found a bit of the Divine in his neighborhood growing up (“Summer Friends”) or even in past romantic relationships (“Juke Jam”) but he knows exactly who the praise goes to when he trots out the classic hymn on “How Great” or brings along evangelical rapper extraordinaire Kirk Franklin on “Finish Line Drown.” And, going back to the song “Blessings” – you have to admire a mainstream rapper that not only throws out a verse about the walls of Jericho but puts in the sound of them falling as a way to punctuate the grace of God. Plus, it includes the mind-blowingly stunning line: “Jesus’ black life ain’t matter.” Now, THAT is something to unpack. Previously, Chance has explored some of the great highs and terrible lows of life but he always ends up a realistic optimist. A noted philanthropist for the struggling youth of Chicago, Chance is not one to shy away from wrestling with the nitty gritty of life – neither glorifying nor disparaging. But here, he doesn’t seem as interested in exploring such a range as he has on past releases. Aside from the aforementioned “Summer Friends,” Chance doesn’t dwell too much on the low end of the struggle so much as keeping focused on how gratitude can pull you through it. The most interesting comparison between Chance then and now comes when you place Acid Rap track “Lost” against “Same Drugs.” Seemingly about the same girl that Chance once found himself lost in a haze of drug fueled intimacy with, the new track is a look back at a friend he once knew, wistfully considering the different paths they’ve since taken. By no means judgmental, Chance offers not so much a plea for her redemption as a simple prayer of well-wishes. It’s a beautiful sentiment – an honest recognition of where he was and where he is now, hoping that others in his life might find the same peace. Honestly, it’s not the most challenging album, lacking the narrative heft of To Pimp A Butterfly or the rallying cry of Anomaly, but it is a blast to listen to. Released right at the cusp of summer, I think Chance knew exactly what he was doing. This is a rapper whose lyrical delivery is as sharp as his ear for a good beat and, considering his track record thus far, anything he puts out is a must listen. As long as you aren’t expecting the breadth of Acid Rap or the experimentation of Surf, you’ll have a great time with this record. And, as I believe is Chance’s intention, it just might make you pause for a moment and think about what you are grateful for in life – and just who you should thank.